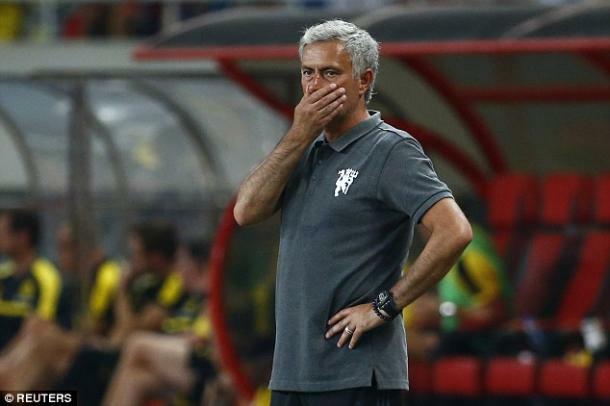 Jose Mourinho suffered his first defeat as Manchester United manager with a 4-1 defeat to Borussia Dortmund. SCORE: 0-1, MIN. 19, CASTRO. 0-2, MIN. 36, AUBAMEYANG PEN. 0-3, MIN. 57, DEMBELE. 1-3, MIN. 59, MKHITARYAN. 1-4, MIN. 86, CASTRO. 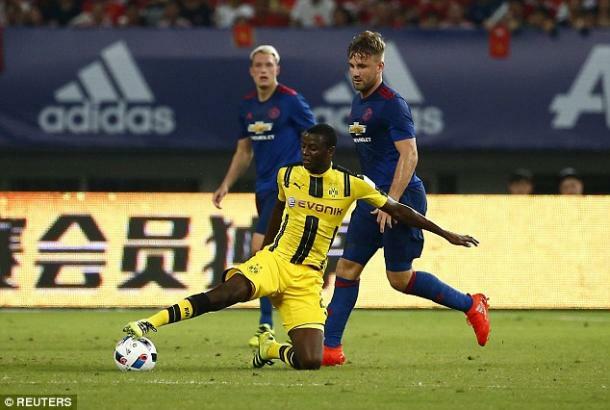 Manchester United suffered defeat in their opening game of their Far East tour, with a 4-1 defeat to Bundesliga side Borussia Dortmund. It wasn't a good start for United, with Gonzalo Castro giving Dortmund the lead, before a penalty from Pierre Emerick Aubameyang saw the Red Devils head into break two goals behind. 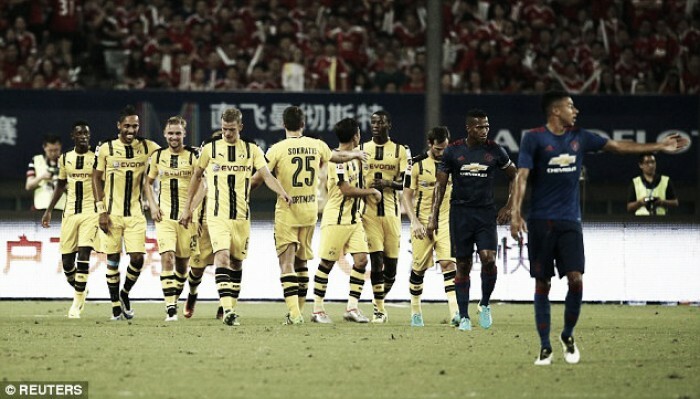 Ousmane Dembélé looked to have ended the contest with Dortmund's third, before Henrikh Mkhitaryan got one back, but Castro finished off the game and sealed Jose Mourinho's first defeat as United manager. Optimism was high as United headed to the Far East, after their 2-0 win over Wigan Athletic, but they made the poor start to the tour. Neither side really put their stamp on the game in the opening proceedings, but it was Dortmund who made the first impact. It was a messy opening strike, when a long free-kick was pushed out by Sam Johnstone, who did well to block the follow-up shot. That however fell perfectly for Castro who managed to bundle it beyond Phil Jones. Jesse Lingard looked to get a instantaneous equaliser, as he went through on goal but his weak effort was straight at Roman Weidenfeller. Aubameyang was arguably one of the best players in the Bundesliga last season, and he demonstrated his quality again here as he doubled the German side's lead. The striker went for the spectacular with an attempted overhead kick but his failed attempt brushed the hand of Antonio Valencia and the referee somewhat harshly pointed to the spot. Aubameyang made no mistake as he struck the set piece down the middle of the goal to make it 2-0. He nearly added his second and Dortmund's third, as his deflected effort looked to have got the best of Johnstone, but the keeper did well to claw it away. The result seemed to be put out of sight just before the hour marl, when Dortmund added their third goal of the contest. New signing Dembele impressed many last season in France, and showed his talents as he danced past Luke Shaw, before putting Marcos Rojo on the ground and firing past Sergio Romero. That goal seemed to kick United into life, as they managed to get a goal back. A fantastic through ball split the Dortmund defence finding Juan Mata. The Spaniard's presence brought Weindenfeller out, and the midfielder unselfishly teed up Mkhitaryan, who slotted into a empty net for his first goal in a United shirt against his former employers. The game died down after United's comeback attempt, but as the game entered the final ten minutes, Thomas Tuchel's side ended on a high. A poor attempted clearance from United fell perfectly for Christian Pulisic, and his effort looked to have beaten Romero, but it went agonisingly past the post. Castro made no mistake moments later, when he added Dortmund's fourth and final goal, five minutes from the end. It was a spectacular way to end the game, as the midfielder wasn't closed down and he took advantage as he rifled an effort into the top corner. Manchester United will take on Manchester City at the Bird Nest Stadium, Beijing on Monday, July 25 with kick-off at 12:30pm BST.